pie charts telling you which apps you used most and what time of day etc, etc. Problem is we’d all probably be horrified by it and delete it instantly! How timely! Just yesterday I was thinking of all the emails I still need to answer, and I wondered, “why do I dread this task?” And it came to me that with each communication by email, I feel like a tiny piece of me is dying. That it makes me feel more separate from people. Vive les conversations! Thank you Rob for this wonderful article and yes…..this great interview in which two human beings show what it means to have a Good conversation! Thanks for the review Rob. 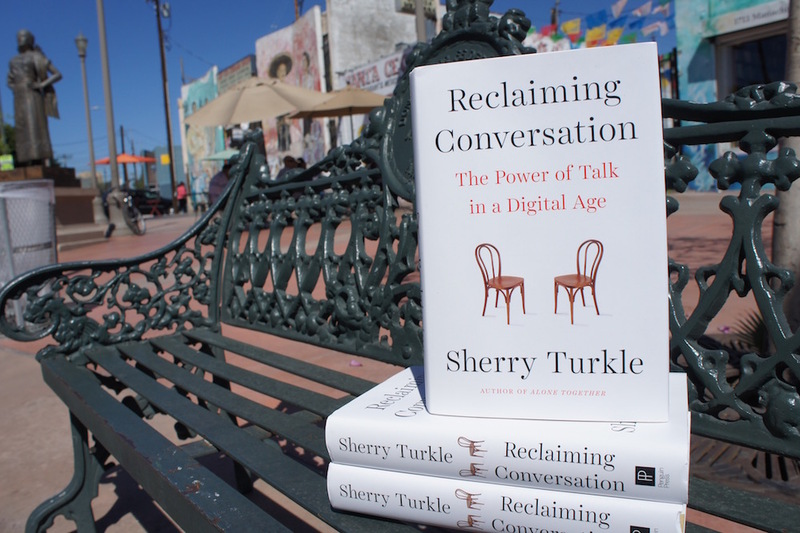 I’ve been meaning to check Sherry Turkle’s work for some time so good to see a new book by her and your post. On the topic of conversation I was reminded of a fascinating and original book I had read some time ago, ‘An Intimate History of Humanity’ by “maverick thinker” Theodore Zeldin http://www.oxfordmuse.com/?q=theodore-zeldin — worth checking out. And John-Paul Flintoff’s wonderfully accessible and bright thinking ‘How to Change the World (The School of Life)’ makes a good case for dialogue and conversation being the beginning of many a (positive) thing when it comes to engaging others, understanding others and trying to change the ways things are (for the better). Happy reading.